Here are the steps you'll need to do. Click each one to see it in more detail. 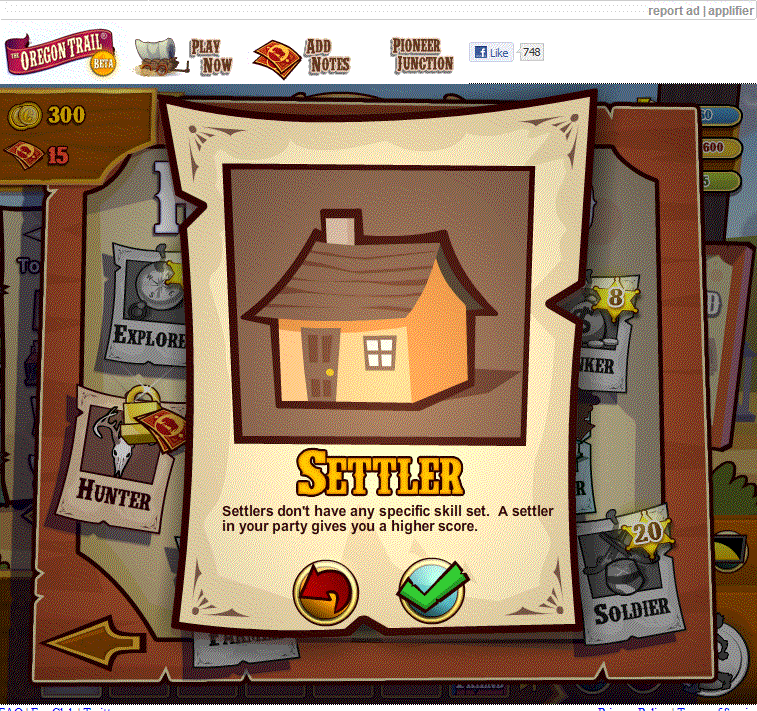 Remenber that bit - 'A settler in your party gives you a higher score.' You'll use it later. Confirm your choice by clicking the green check mark. In the same way click the wagon bed. This time I'm choosing a bed which costs money, the Conestoga wagon ($100) since it has a slightly larger capacity, is in better condition (won't break down as often) and floats better. It's slightly slower but on a first run this won't matter. Once you've selected it you'll see a price label added to it. In the same way click the wagon wheels. Again I'm choosing ones which cost money, the weathered wheels ($55) since they do not have the 'slight speed reduction' that the standard wheels have. In the same way select the wagon cover. The free option is a good selection this time. Once you have selected this click on the two price tickets to confirm your choices. You'll notice you now have $245 left. 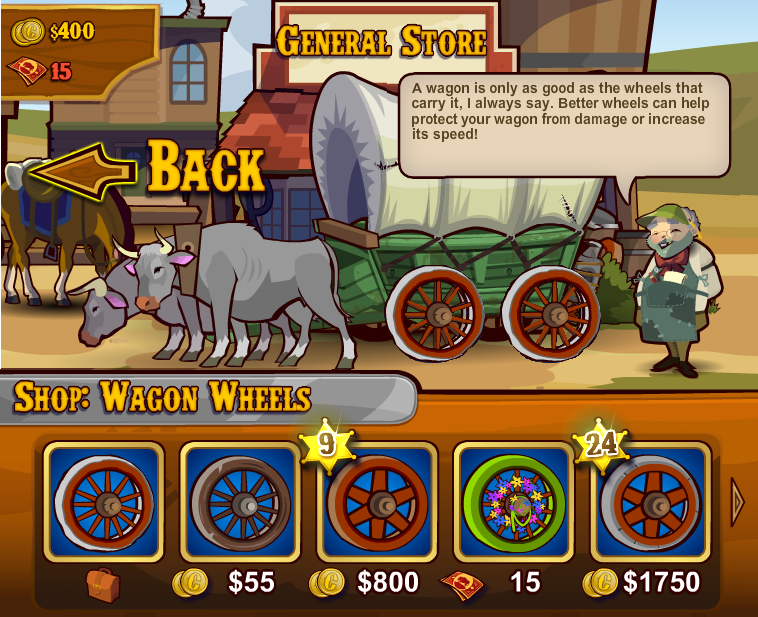 Your wagon should now be complete so choose the back arrow to return to the store entrance. 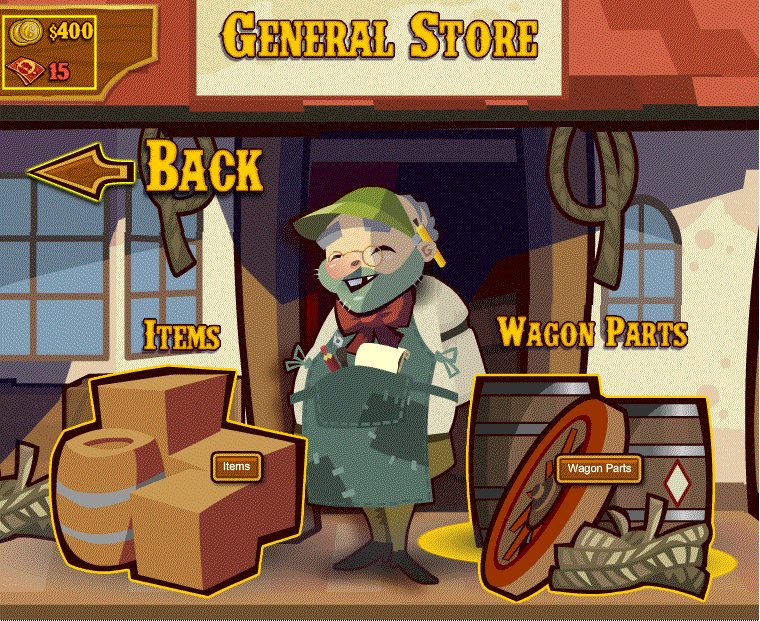 Back at the store entrance you need to click the boxes at the left (Items) to start stocking your wagon. You now have $245 left and need to buy some rations for the journey. 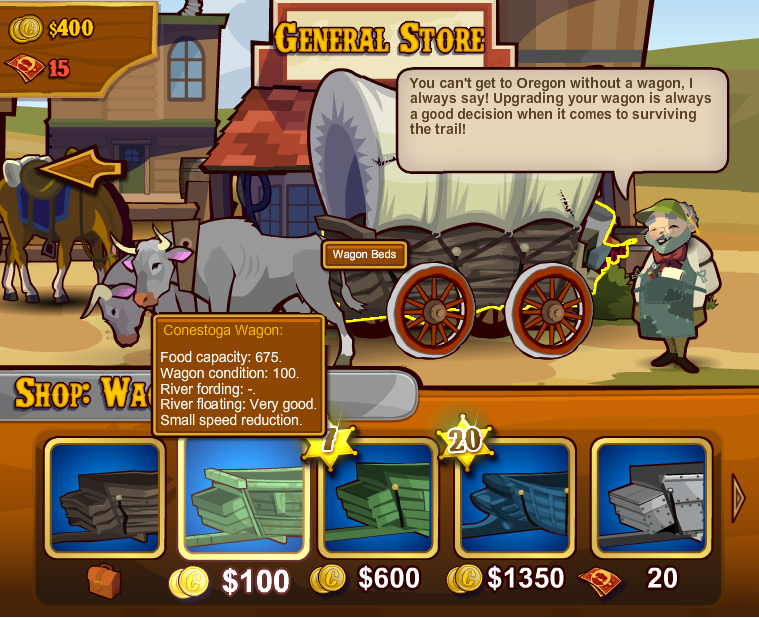 Buy 'rations' until your wagon has as much as it will hold. You will have $170 left and it's worthwhile spending a few minutes looking at the other items you can buy ...but DON'T buy anything yet! Once you've finished window shopping go back to the 'Medicines' tab and buy four batches of lemons. That will leave you with $110 which you shouldn't spend yet. Why did I buy four lemons? 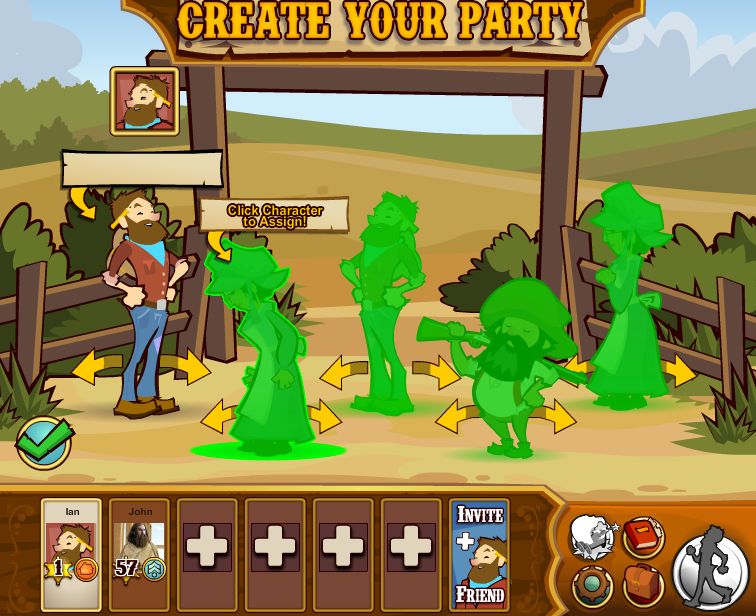 On your journey you can encounter mishaps which will cause you to lose items. 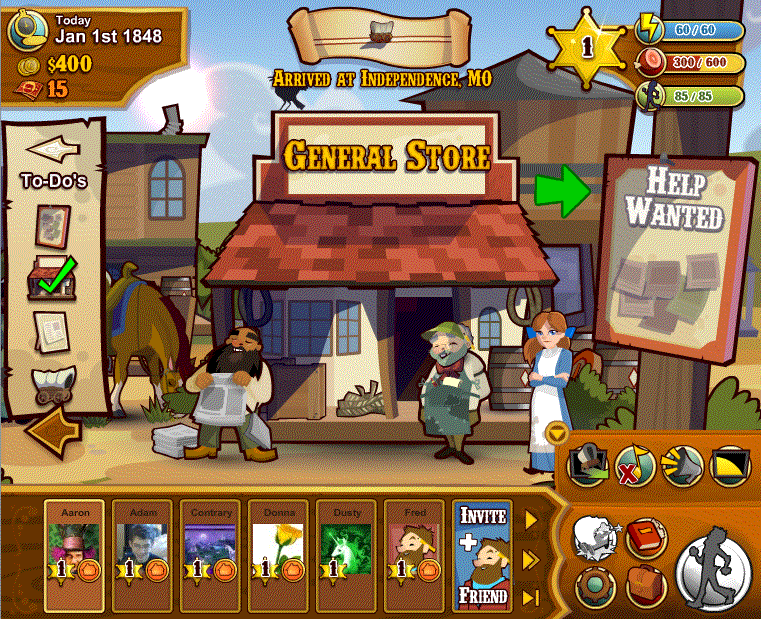 The items lost are items bought for cash in your inventory. By placing lemons as the first item when you lose something it will be an inexpensive lemon rather than a much more expensive and useful item. The lemons will stack on top of each other and you can store up to 10 in your inventory slot. Of course they also counter scurvy. As you travel if you lose any items make sure you buy more lemons at the next available store which sells them. Why shouldn't I buy anything else? 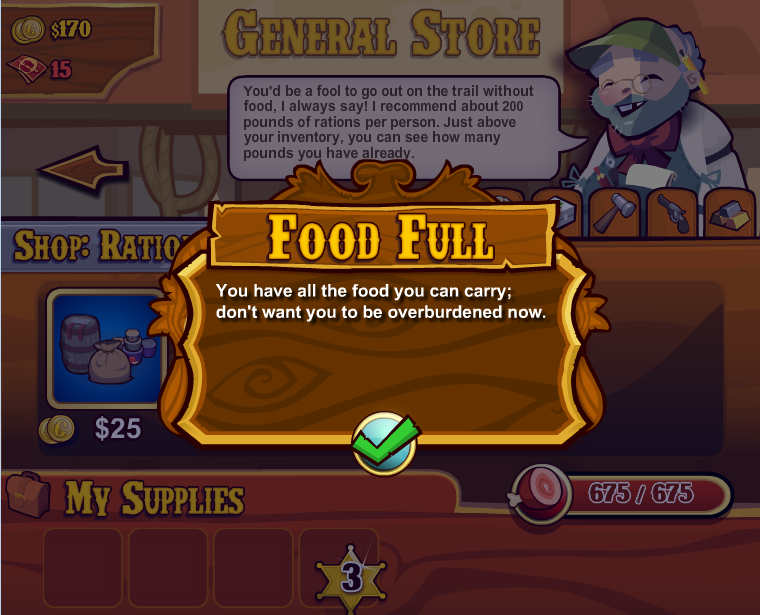 You'll need your money to buy more food in the early stages of the game. It is possible to hunt for food but at first you probably won't be good at this. It's also possible to collect extra money en-route but again this takes a little practice. As you gain experience you can buy more. This is where you start adding four of your friends to your team. 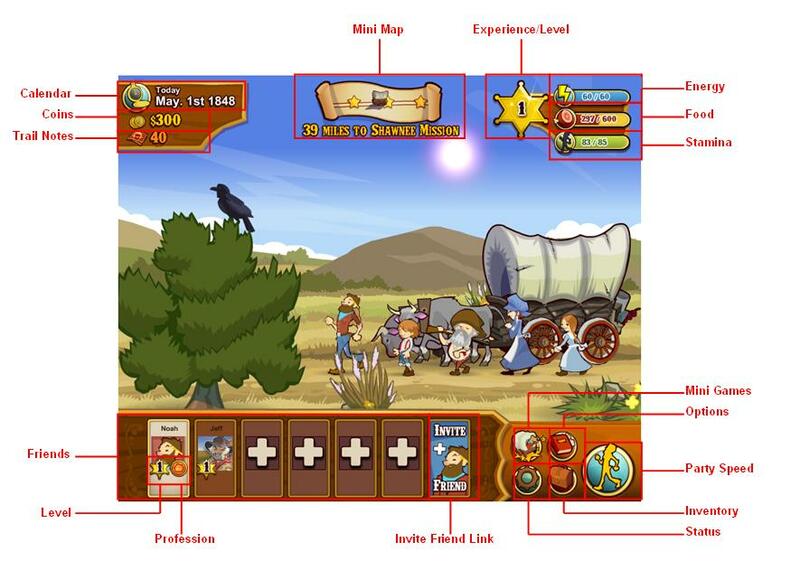 Your friends who play the game will be displayed along the bottom of the game window. 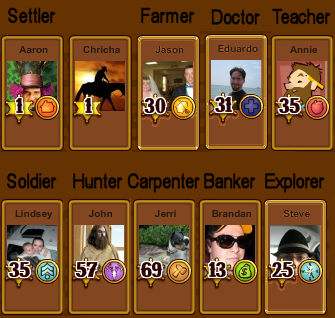 At the bottom of each one you'll find their level and an icon which represents the occupation they are currently playing at. What if I have no friends playing? Ignore the top and middle sections and type your name to replace the name in the bottom section. Confirm your choice using the green checkmark. If you wish you can now use the yellow arrows to change the character image. 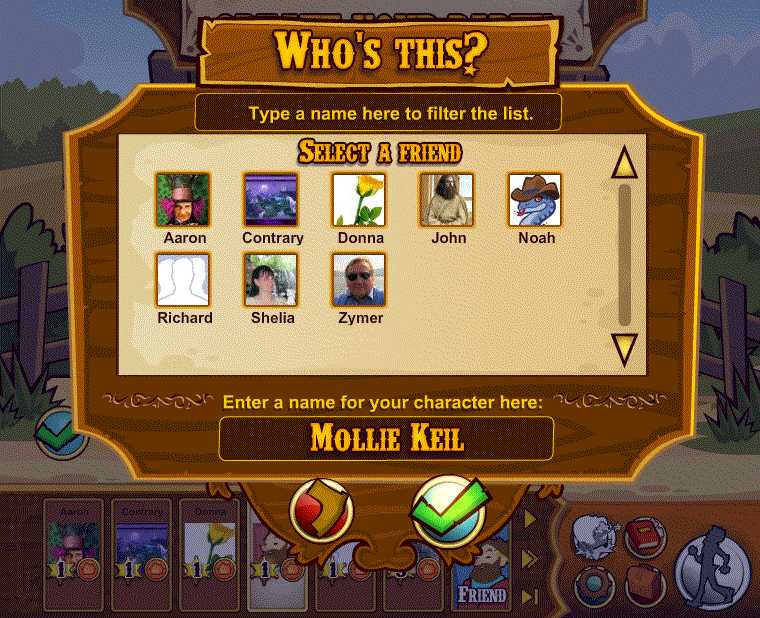 Scroll through the list of friends. If you have a lot of friends on Facebook start typing a name in the area 'Type a name here to filter the list' to find them quickly. Select the icon of the person you want. 3. You can now use the arrows either side of the character to change their appearance. WARNING! 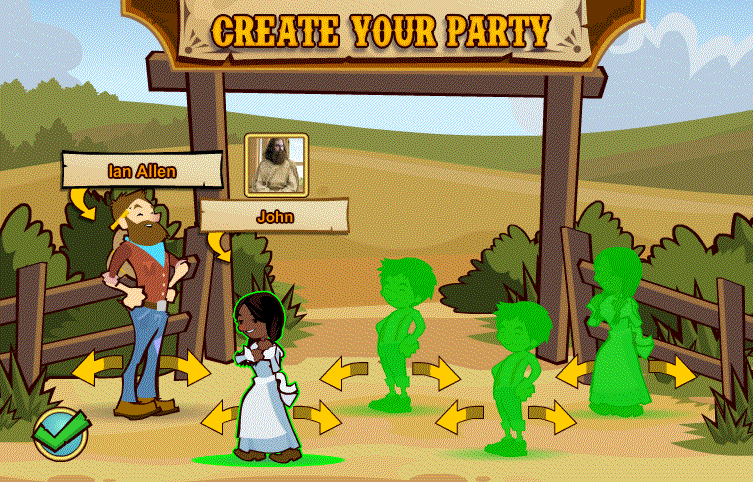 If you select the person you've just chosen again you'll have to go through the whole process again. Make sure you use the arrows only! 4. Repeat for the other characters. 5. Once you have four teammates, click the green checkmark at the bottom left to start. WARNING! If you get distracted and open another page while choosing characters you'll have to start again! 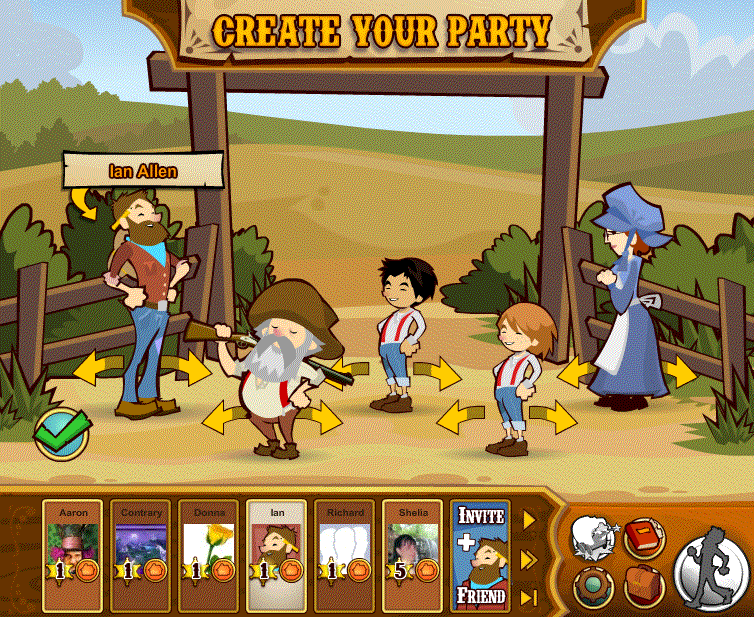 I suggest you use the first method - clicking the wagon - in your first run. Note - it is possible to start without buying rations but it's not a good idea. 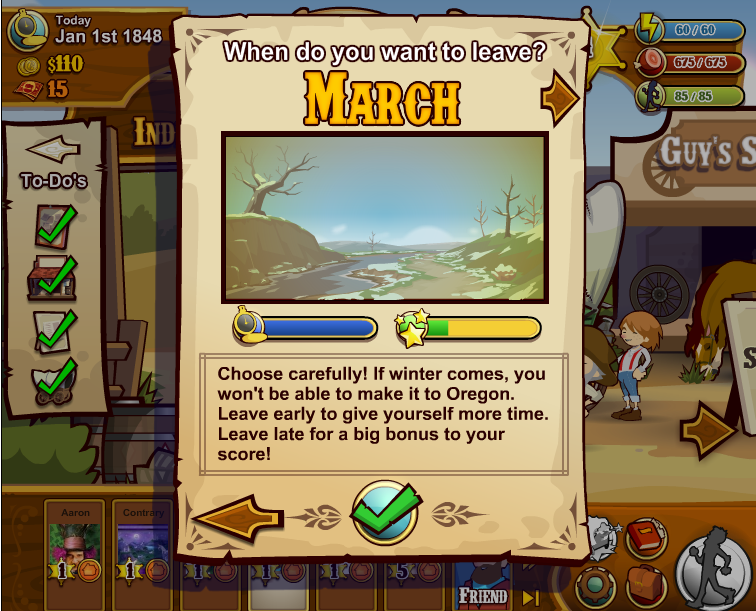 IF you click the wagon, you can now choose the month you want to start your journey. Hint - On your first trip set it to April. Confirm your choice using the green check. 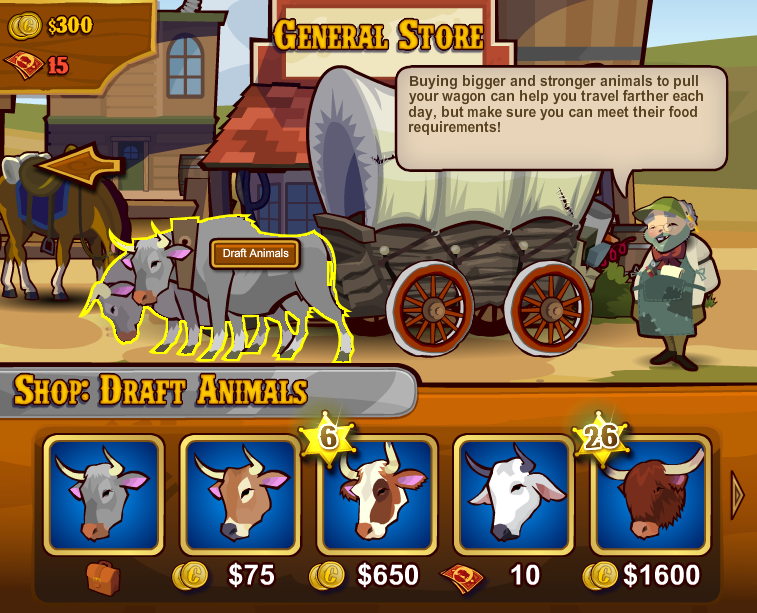 In real life people on the Oregon trail had to wait until the grass started growing or their oxen would not have food. Wait too long and there was a danger of drought or even worse - getting killed by winter storms. 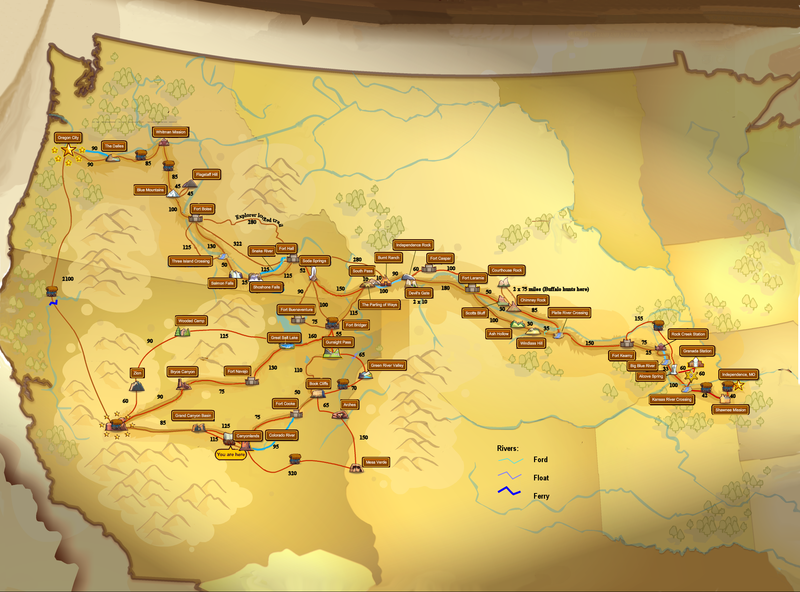 You must complete your journey ny December 21st. If you haven't already figured it out - use the gear cog icon to turn off the music! Without food your team will lose health. If they are already sick they may die. 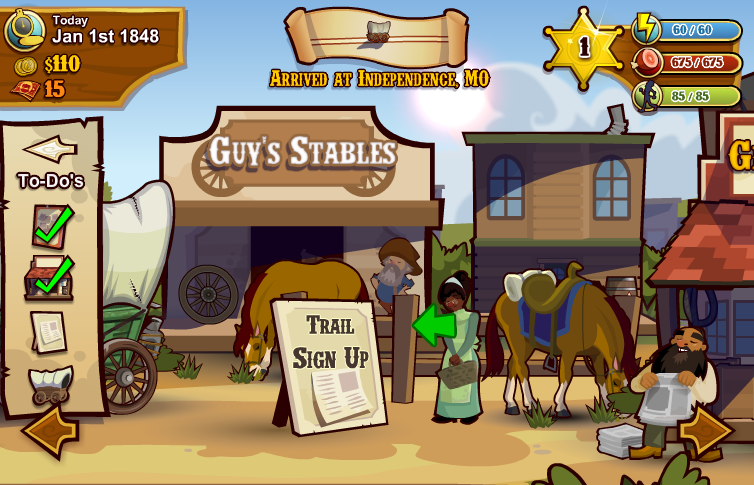 Energy will accumulate every minute, you can also find energy jugs on the trail; Stamina every two minutes. 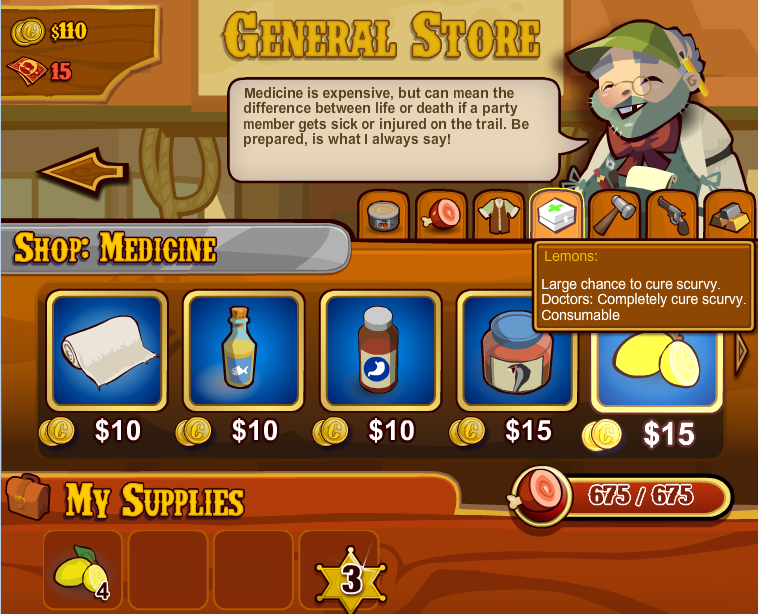 You have to buy food, find it on the trail or hunt for it using the mini-game. The Star shows you your level. 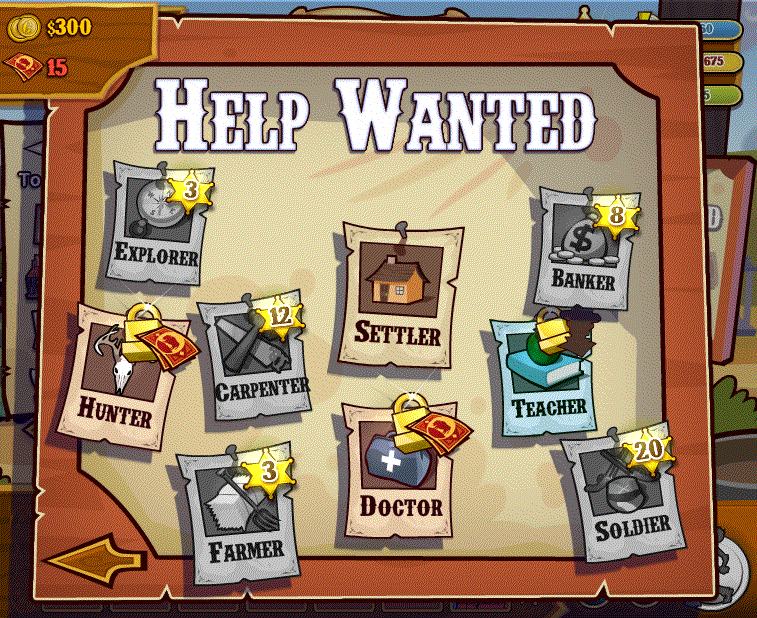 If you move your mouse over the star it will tell you how many experience points you have and how many are needed for the next level. 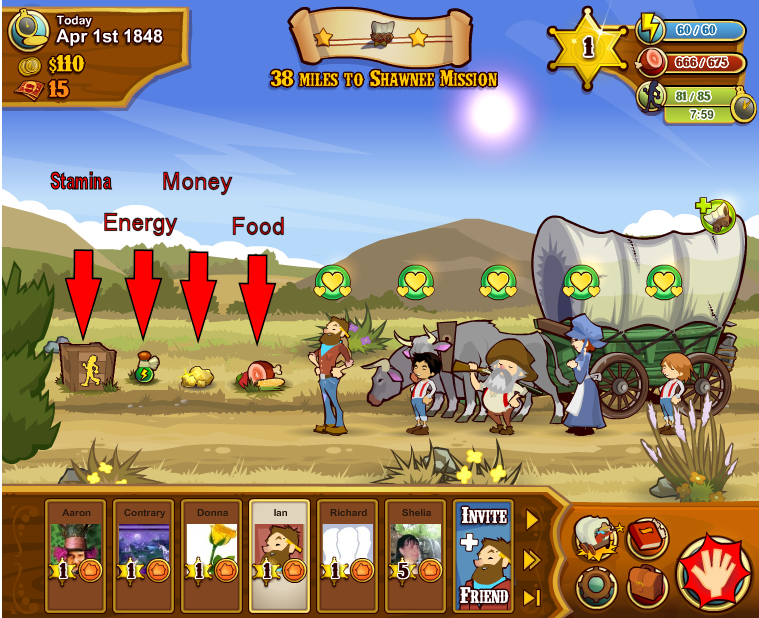 Watch out for these four icons on the trail and click them to get extra stamina, energy, money and food. 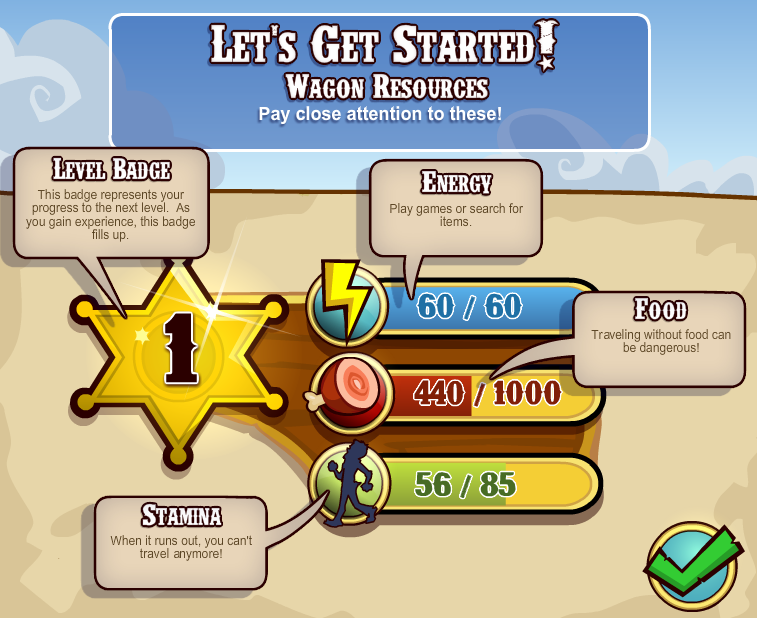 Learn that you can stop the wagon by clicking the 'red' hand and choosing it again in the sub-menu. 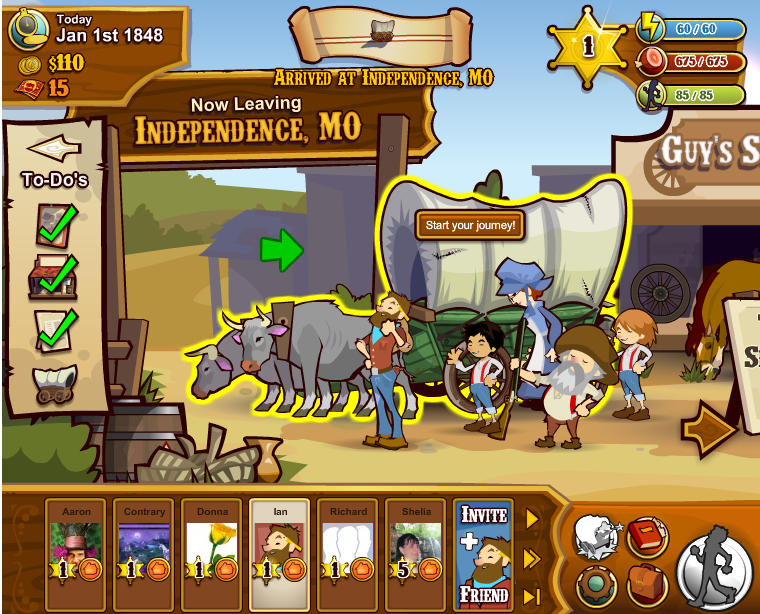 In Independence the 'To Do' list at the left should have a green checkmark on each item before you can start. If you need to restart look for the book (Status) icon and click it. 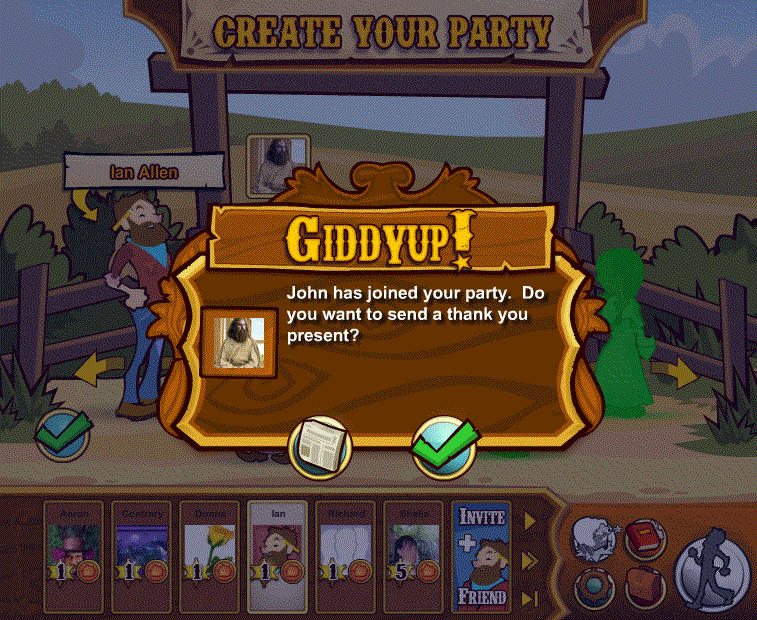 At the bottom right of the popup which opens you'll find a 'Give up' icon. Use that to go back to Independance. 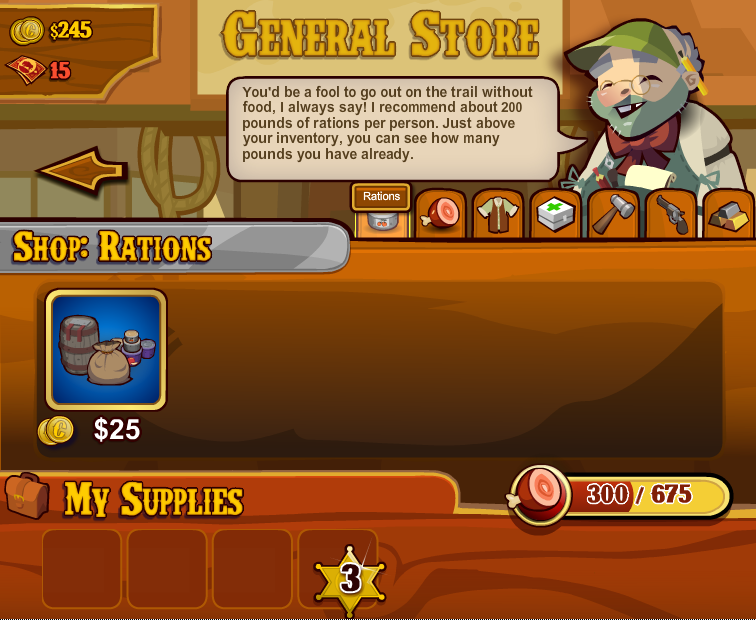 You will keep your stamina, coins, inventory items and resart with 300 food. 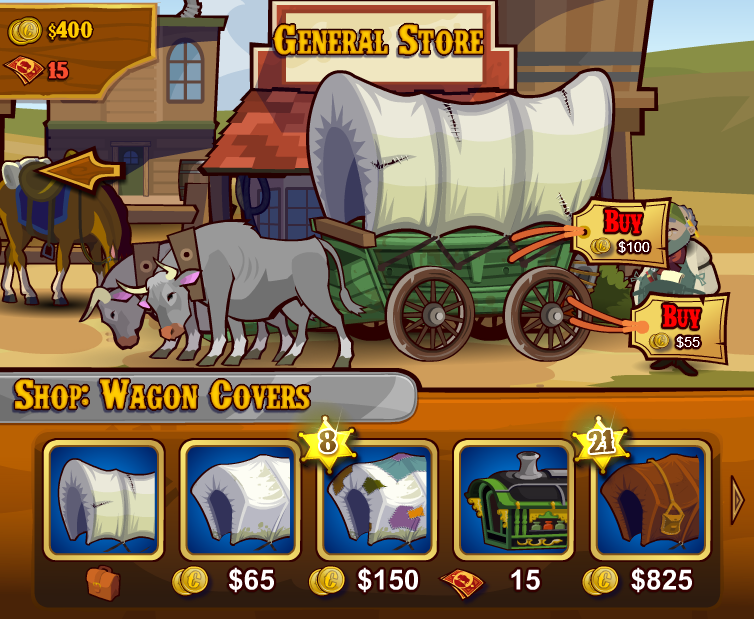 As soon as you start the wagon rolling click the covered wagon icon to stop and play the 'Search the scene' mini-game. You may not find anything but your 'energy' level will reduce by 15. Any energy you now collect on the trail won't be wasted now. Do this any time your energy gets within 15 of the maximum.